Yesterday, I wrote about how I believe that teachers need to be the ones creating and sharing out mentor texts as we make a shift into digital composition. Today, I want to focus on a project that began with a traditional text (sort of) that allowed my students to take advantage of the digital architecture of the web, and my ideas for how to take that project one step further. It all began with some students reading and enjoying the Make Your Own Adventure stories. I remember these books from when I was a kid, but they were making another comeback a few years ago. If you are not sure what these books are, they are stories in which the reader makes decisions about where the story is going. In the books, the reader moves to different pages, flipping around the novel and never going in sequential order. I had a small group of students who were fascinated by these books, and one asked me how did authors do that? How did they write a book with so many choices? And as I thought more about it as a possible writing project, I began to see the Web as one possible place to create Make Your Own Adventure stories. In particular, those books reminded me of something we take for granted when we are online: the power of the hyperlink. In fact, it is the hyperlink that underlies just about everything that makes the Web a different kind of writing space. Your ability to connect one thing to another opens up a lot of doors. Using the books as a mentor text, I guided my students to create their own Make Your Own Adventure stories (using yet another mentor text, Chris Van Allsburg’s The Mysteries of Harris Burdick for story inspiration). We worked on mapping out the stories first, visually showing the choices that a reader might make. Then, we used a wiki site to publish the stories, embedding the choices as hyperlinks that lead to either dead ends or further elements of the story. So, I figured: Let’s give it a try. Here is what I came up with yesterday: The Mysterious Sweet Fruit. It’s not as difficult as it seems, and it is a lot of fun, and just think of the critical thinking skills that would go into students creating such a composition. Choices around video production, story adventure writing and use of technology, plus the prospects of an authentic audience, would all come into play. Of course, this assumes you have YouTube access, and a school/classroom account. Again I am sitting here with a slackjawed expression considering the possibilities you introduced to me today. Also thinking about what a great model you are of a lifelong learner you are. 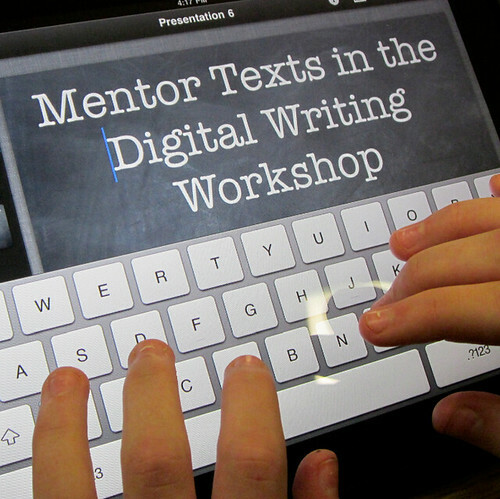 Thanks for joining us on this blog tour of Mentor Texts in the Digital Writing Workshop. I’ve been thinking about this too. I tried to recreate the experience with webquests in my classroom and it’s a great exercise every once in awhile, especially when you ask students to make their own, but students are looking for even more. I’m not surprised that this is where you’re thinking is after what you have been dong in your classroom. Do your students have any ideas for how to do that technically? I don’t think my students yet have that kind of expertise, but a surprising number of them have YouTube accounts, so it would not be completely new territory for them. I think.